To mark the celebration of World Earth Day, Clark Development Corporation recently held its 13th Recyclables Collection Event 2016 and the launching of the Ban on Plastics & Styrofoam at Clark Freeport Zone. Facilitated by the Environmental Practitioners Association (EPA), Clark Development Corporation and DENR-EMB Region 3 initiated the banning of Plastics and Styrofoam in Clark Freeport Zone. This is the first banning of plastics in Clark since December 2015. "This is to give awareness on how to properly dispose hazardous wastes because we have a lot of problems on wastes" said Engr. Leslie Baun, Environmental Practitioners Association President. Engr. Baun reiterated that they are doing this because of climate change and to help reduce Ozone Depleting Substances (ODS). On the other hand, Engr. Rogelio M. Magat, Environmental Permits Division Manager of Clark Development Corporation narrates that the said event is just one of the projects of CDC for the environment. Thus, they are geared to promote eco-bags and other environment-friendly packaging materials among their stakeholders. "We, here in Clark Freeport Zone are trying to be one of the cleanest and greenest eco-zones in the Philippines. We want LGUs to replicate what we are doing here in Clark. We are not only doing business, we also fulfill our obligation to the environment as one of our Corporate Social Responsibilities," said Engr. Magat. Around 50 to 60 companies from commercial, industrial, and hotels participated in the collection of recyclables. 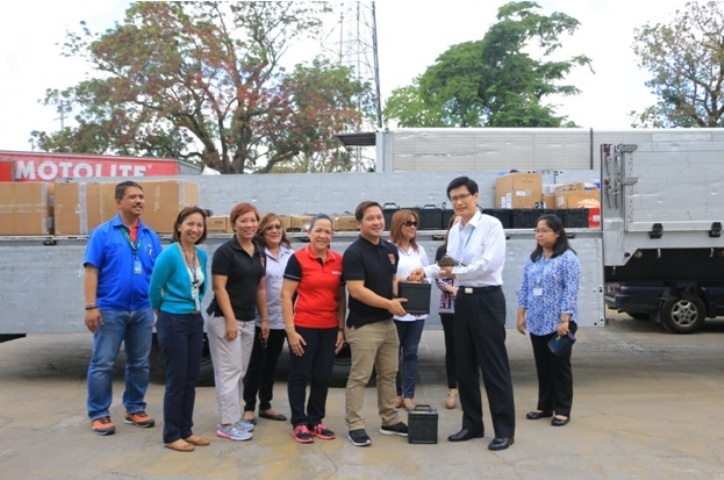 At the same time, an estimated 3,500 kilograms of used lead acid batteries were donated to the Bantay Baterya Project of ABS-CBN Lingkod Kapamilya Foundation, Inc. The monetary value of which will be used by Bantay Kalikasan program for its environmental efforts nationwide. CDC also encourages other companies to take responsibility by participating in this cause. In a continuous effort to sustain awareness, on June 24, 2016 the EPA will hold another recyclables collection at Angeles City Proper, where it will be open to all. Amartron Inc. turned over their used batteries for Bantay Baterya prjoect of Bantay Kalikasan.